We’d switched our normal day out caching to Sunday and were looking forward to trying the Cole Challenge, a new set of 16 caches along the banks of the River Cole in E/NE Birmingham. They looked to have lots of sneaky hides and something a bit more of a challenge – just the kind of thing we enjoy. We set off and had intended to come off the M6 to the north of the caches near The Fort but as we drove along the M6 it was clear that the motorway exit we thought was here did not seem to exist. We ended up having to carry on to the M42 and then coming off by the NEC. Quite a bit of a detour but it was still early and the roads were quiet, so not a great problem. We parked up not far from #4 in the series and got the bikes out of the Jeep. We had intended to do the series in sections, moving the Jeep round as we go and picking off caches near to where we park before moving on to the next section. As it turned out, it was easier to just do the whole series plus a few others in one go by bike. The first cache was a quick find, although you’d struggle to get it if you were short. The next one we could not find so decided to have another look on the way back. We had just found the third cache when someone cycled up and said hello. It was Luke, who caches as m3vvb and whom I’d been chatting to on Facebook last night trying to work out the best way of tackling the series. We joined forces and did the rest of the caches with Luke, even though he’d already found some of them so just stood back to watch us search. When we returned to the one we had just DNF’d, Isaac spotted it after a short search. A really nice hide which blends in perfectly. The rest of the series was uneventful apart from one DNF (at cache #8) and quite a few sneaky hides, which I won’t go into detail about here as I don’t want to spoil it for anyone who has not done the series. At the end of the series, we did three other caches that were by the River and were on the way anyway. One, Bridge over the River Cole, we’d DNF’d the last time we were in the area (it had been muggled at the time I think) but was a quick find today. We then made the long ride back to #8 for another look. After quite a long search (well, 10-15 minutes anyway) we still could not spot it. A micro in the woods with a hint that meant it could be anywhere is never going to be easy. It’s a shame we could not get this one as it would have meant we’d finished the series, but never mind, that’s life sometimes. We said our goodbye’s to Luke and headed off to the Jeep for our sandwiches. After this, we decided to go to the Ward End Park series – a set of 5 caches plus a bonus cache around a nice looking park not too far from the M6. We set off on our bikes and soon had all 5 caches bagged. We did a double take when we plotted the co-ords of the bonus cache as it was about a mile away and nowhere near the park. Hmmm, we’re not going that way so that one will have to wait for a future visit. We’d planned to finish the day with the new set of caches near Bescot – that’s just by the RAC Building where the M6 and M5 meet, if you don’t know the area. 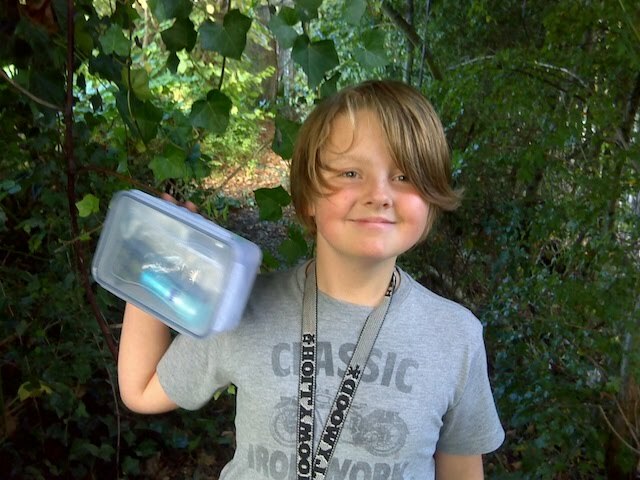 Isaac planned a route over to there, via a few quick and easy caches. Two quick Sidetracked caches followed, then one called A Piece Of Cake, which was anything but the cache name and totally eluded us. We gave up after a short search as we did not like all the rubbish at GZ. We also had another DNF on a micro behind one of those horrible metal fences with bars everywhere. The cache could have been literally anywhere and as is usual with this kind of hide, we got bored and moved on. Not sure we’ll be back to be honest as we don’t like this kind of hide at all as it’s not fun to look for. Next on the list was one in the Grub Grab series. We’d seen this mentioned on one of the forums (or was it Facebook?) when the series came out and did not have high hopes for it but were pleasantly surprised. The cache was quite near a McDonalnds admittedly, but it was in a nice looking park just out of sight of McDonalnds and was a Regular sized box with some decent swaps in. Not bad at all for an urban cache and certainly much better than the usual nano you get in these situations. We had yet another DNF at Sidetracked Tame Bridge – the cache was nowhere to be seen in the guard rail it was supposed to be in. It turns out someone must have muggled the cache and thrown it over a nearby fence as another cacher had spotted it there. Finally it was time for the 4 caches along the wildlife area at the side of the Bescot railway depot. The first was a quick find, then we spotted a group of 20+lads racing motorbikes around the circular area where the remaining three caches were. There seemed to be quite a few bushes to hide the cache finding from them so we pressed on to see if it was possible to get the caches undetected. It was and all were nice quick finds. Just time for a few more caches before we get back on the M6 northbound for home. A nano by a Kebab shop (why is there a cache here? ), followed by another Grub Grab cache, this time outside a Pizza Hut. We then went off to find a quick drive-by near where one of the Walsall Cacher Meets had taken place. We can squeeze one final cache in, just about, so headed off for an interesting one which was on top of what is probably the highest point in this part of Birmingham. The cache was clearly by the side of a church but all the church helpers were shutting up for the day and stood outside chatting before going some. Luckily there were some information boards nearby so we stopped to read these while we waited out the muggles. This made it worse as they then came over to tell us all about the history of the area and even popped into the church to get us some leaflets about it! All we wanted to do was find the cache, but we’re glad they did stop to tell us about things as it was really interesting and really added to the cache and why we had been brought here. 38 finds for the day. We’d have loved to get 2 more to make it a round 40 but our Sunday Roast was going to be on the table by the time we got home and it was just too tempting.